Our readers surnames from County Cork! Deep breath – there are a lot of them here – is your County Cork surname among them? Like to add your County Cork surname to our list? Just signup for your free weekly Letter from Ireland by clicking here. – and we’ll let you know how to join in the fun. O’Shea, O’Sullivan, O’Tuama ,Parker, Phelan ,Phillips ,Power, Poythrus, Price ,Quinlan ,Quinn, Quirk, Reardon, Regan ,Reilly, Riley ,Riordan, Roach ,Roche, Rogers, Ryan, Rylee, Saunders ,Savage, Shea, Shearin ,Sheehan, Slattery, Smith, Snee, Steele ,Stewart, Stone, Sullivan, Sweeney, Taylor ,Terry, Thomas, Tooker, Toomey, Tracey, Tuckey, Walsh, Whalen, White ,Wholey, Winters. Hi Claire – McGrievey/MacGreevy comes from the Irish Mag Riabhaigh. The name comes from the area of County Roscommon. Hope this helps – Mike. Interesting Linda – Corbett is an English/Norman/French name often used for the Irish name Ó Coirbín (pronounced Oh-Corr-been) in Connaught. Corby is a different name used for the Irish Mac Corrbuidhe. Mike. I see my surname listed here, though it was my understanding it came from Ulster in the region of Tyrconnell. Is there anything more you can tell me about it? Yep – the leading family/tribe were from Donegal. Some smaller ones elsewhere. In this list these are the names of our readers whose ancestors came from this county. Mike. I am researching my father’s side of our family tree. Last name is Kellar, was told the it changed from Kelleher. What can you tell me? Yep – Keller is a version of Kelleher – found in Cork and Kerry from the 1400s onwards. Mike. Hi Cindy – thanks for the feedback. In Ireland, Coffey is normally the angicisation found of the various septs still. Mike. I see Kennedy in Cork and a couple other counties. If my great great grandfather left from Muff, would that mean that branch of the family were from Londonderry/Derry and probably Protestant? Oh, I have so many questions ,I don’t even know what or how to ask!! LOL..but I’m learning so much. Thank you, thank you, thank you. Hi Sandra – the Kennedys in Ulster are often of Scottish origin (the Irish went to Scotland as Kennedys and some of them came back to Scotland as Kennedys and presbyterian) – this may explain your Kennedys. Mike. Since my g-grandparents, O’Connell/O’Leary married in England, I have not been able to track them back to where in Ireland they were born. Cork? County or City? I wonder? Some day my daughter and I want to come to Ireland, it is so beautiful. Thanks for your work. Hi Sue – most O’Connells would be from Kerry/Limerick. Most O’Learys from Cork. Hope this helps – Mike. My great grandmother’s name was Ellen Coyle, her mother’s name was Mary Plunkett. I haven’t seen any Plunketts in your list. Is Plunkett an Irish Surname? Hi Molly – Plunkett came to Ireland after the 1200s with the Normans. It is mentioned in many articles on this site. Just type to name into the search box on the top right of the page. Mike. This is the information I have. My great, great, great grandfather, James Lamey, was born in County Cork in 1771. He iemigrated to Canada in 1800, where he married and raised his family. I do not see my family name in your list for Cork and am wondering if the name has vanished. I would like to know from where in Cork he emigrated and if our surname survives in Ireland. Many thanks for all that you do! Hi Linda – a rare and unusual name in Ireland. Here is where you find the Lamey surname in the mid 1800s: http://www.irishtimes.com/ancestor/surname/index.cfm?fuseaction=Go.&UserID= – as you can see, mostly in County Limerick. Mike. My maiden name is Kelleher father from Clondrohid co cork. Mothers maiden name Geraghty from Dublin. Paternal grandmother was Riordan maternal grandmother was a Best, which I believe may be an English name. Please clarify if there where many English Bests in ireland and when and where they may have arrived in Ireland. The name came to Ireland from the 1600s onwards. All the “best”, Mike. Hey there, my last name is Noonan and my mom has traced our family tree back to County Cork and I dont really know much about it or the Noonan’s or County Cork and was wondering if you could please tell me more or a webpage I can find more info. Thanks in advance. Hello, This is the information I have. My great, great, great grandfather, Dennis Dingivan, was born in County Cork in 1856. He immigrated to Sommerville Massachsetts in 1922 or so. I do not see my family name in your list for Cork and am wondering if the name has vanished. I would like to know from where in Cork he immigrated and if our surname survives in Ireland. Thank you so much! What can you tell me about the O’Reagan surname? My grandmother has said that the O’Reagan’s in my family came from County Cork. Thanks for any information you may have. Am going to Ireland in a month for my 60th – a dream come true. father’s name Coyle and mother Daly. was told we re from Cork and somewhere else. do you know? I was looking for the surname Giddeon. Do you know where this name comes from? Hi – Was wondering if you have any information on the Boice surname. I’m looking for info on Andrew Boice (1845-1922) and his parents John Boice and Margaret Campbell. Also looking for info on Mary Jane Montgomery (1845-1926) and her parents John Montgomery and Annie Taylor. All born in Ireland, I believe from County Cork. I have Andrew and Mary Jane’s Death Certificates from Philadelphia, Pennsylvania, USA. Thank you! I found a book, “History of Delaware Co., Pa, and Its People, A, Vol. 3 (1914)” at http://www.archive.org/details/historyof delawar03jord. On page898 it says: “Andrew Boice was born in Scotland. When he was four years old his family moved to Ireland, remaining there until he was thirteen. He received a portion of his education in the Irish National School and in the Brooks Academy. He married Mary J. Montgomery in Scotland, who was a native of the land of heather. After their marriage they came to the United States, spent one year in Omaha, Nebraska, and then came to Philadelphia, where he now lives a retired life. He was the parent of ten children.” Note that it says he was born in Scotland. I know this conflicts with the Pennsylvania death certificate. I believe the book because it has a fair amount of detail of his life. I believe, given the publication date, that Andrew was interviewed by the book’s author. There are a lot of these “History of XXXX County” books available on the web. I think they were compiled mostly through interviews. They are not error free, though. But I think this one is right. I have not had time to try to verify the Scotland birthplace. I’m looking for Donovan’s from Skibbereen County Cork. Any info would be appreciated. My last name isn’t on here, but I know it should be. It is considered one of the “rare” last names in Ireland, but is uniquely Irish. The Last name is Morey. I was told by word of mouth that my family comes from Cork County. There were also rumours if family in Limerick, but that isn’t verified. I was born in the US. I have Irish on my mother’s side as well under the name Johnson, which is just as hard because of how common it is. Two opposite issues with the same result. I can’t find my family in either direction. To make matters more complicated I am having trouble following the paper trail because my Irish ancestors on the Morey side, were not treated well when they came here and they married Native American, so I am both Aboriginal and Irish. Any help locating my family would be wonderful. Thank you. My nana and grandfather were roach and Reardon and I believe atleast one was from county cork.but it might be great grandfather. Man am I getting old. My Great Great Grandfather has told my family stories growing up that out family originated from County Cork Ireland with the last name Coble. Can you tell me if you know anything about our family? I don’t know if the name changed any. My Great Great Great Grandfather came to the US from Cork in 1863, he was the first immigrant of the O’Keefe’s (now just Keefe’s) to begin a huge family line in Ohio mostly and a few other states. Pretty cool to learn this stuff! my Grandfather came from County Cork. His name was Good I was told they came over in the 1600 s and grew flax . My gggrandfather was Michael Patrick Walsh. I have a baptism entry for his daughter in County Cork, in 1834. I am not sure if this is County Cork or County Waterford. Thanks so much for help! Looking for information on the Cairns name. I know my great great grandparents immigrated from somewhere in Ireland 1810 to Prince Edward Island , Canada. I know the name stems from the O’Cerin clan and Ive been told its most likely a county Mayo name. It seems that all the relatives are Roman Catholic. Any info would be apprceiated. This is helpful,because my DNA shows that the majority of my Irish ancestry comes from County Cork and the Munster area and I found the Harris surname on this list.I now have a place to start to reseat the Harris line. 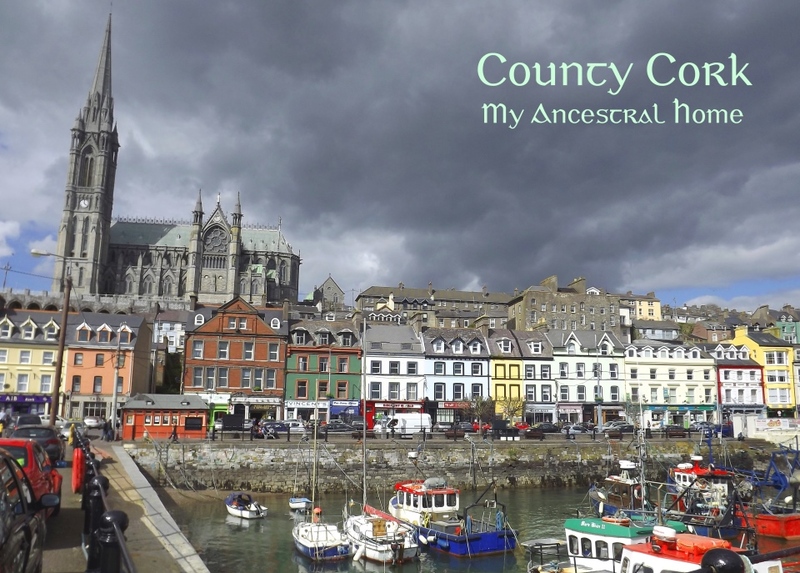 I found out a few months ago that I am part Irish and that my ancestors are from County Cork. I don’t know exactly who they were but they were a part of the Burke family. I am excited to learn more about them one day and even visit County Cork as well. That’s great news Selena. Many people left from Cobh in Cork and a visit here would be wonderful. I have seen where my Great Great Grand Father upon getting his American citizenship signed his name with an “X”. The paper also showed Hagerty not Haggerty. Who made these early changes and how can one go about getting the original spelling back? Is the Hagerty/Haggerty name one of the spin off sects from the O’Niells? Many people like your Great Great Grandfather relied on others to write down their names on official documents and so there were often changes in spellings and surname variations. I know my family is from Cork and my ancestry DNA and 23&Me DNA both confirm it but I’m having trouble pinpointing exactly where in Cork my family is from. Ancestry points me to West Cork. But that’s as far as it goes. I’m looking for town/village. Any help would be greatly appreciated. Patrick, As we say here Ancestry brings you part of the way and in the Green Room we bring you all the way home.